Planting forested buffers on farms is an agricultural best management practice that tops the list as one of the most cost-effective ways to reduce pollution in the Chesapeake Bay and its rivers and streams. Photo by Carmera Thomas/CBF Staff. Pollution is the enemy of clean water. And if we want to leave a legacy of clean water to future generations, we need to take action. But what are the sources of pollution to the Chesapeake Bay and its rivers and streams? Pollution sources include but are not limited to agricultural runoff, urban/suburban polluted runoff, and wastewater treatment plants. Of these, agricultural runoff is by far the largest source of nitrogen, phosphorus, and sediment pollution to the Bay. While we all want clean water, it cannot be denied that fighting pollution is often expensive. From a purely economic perspective, we should implement the pollution reduction practices that give us the best bang for our buck. Fortunately, the least expensive ways to fight pollution also targets the largest source of pollution�agricultural runoff. Look no further than this graphic which was highlighted on page six of our most recent Save the Bay Magazine: The price tags speak volumes. While pollution needs to be cut across the board, it is clear that implementing best management practices (BMPs) on farms throughout the watershed is one of the most cost-effective ways to save the Bay. Moving forward, we need to help farmers through providing funding and technical assistance to implement BMPs, some of which include installing forested buffers, fencing livestock out of streams, and planting cover crops. Ultimately, if we are to reach our clean water goals set forth in the Chesapeake Clean Water Blueprint, addressing agricultural runoff is paramount. Leaving a legacy of clean water to future generations is on the line. Want to help CBF plant forested buffers in Maryland? Check out our upcoming plantings! Gambrills, MD: Help the Chesapeake Bay Foundation and partner organizations plant shrubs and wetland grasses at the former Naval Academy dairy farm! Sunrise Farm is an 800-acre farm, the largest organic farm in the State of Maryland. Volunteers will plant a newly graded wetland in what was a wet less productive corn & soybean field. Click here to register! Richmond, VA: The Richmond VoiCeS Course, an eight-week adult education class meeting on Tuesdays, starts September 13! This course will cover the history of the James, urban and rural runoff issues and solutions, practical methods to improve water quality in your backyard, and the critical importance of citizen action to saving the Bay. Plus, there are field trips! Click here to register! Oxon Hill, MD: During this three-day event (September 16-18), we will build concrete reef balls designed to help restore fish habitat in Smoots Bay on the Potomac River. The final destination for the reef balls is the bottom of Smoots Bay, where they will be intermixed with various woody structures to provide an ideal habitat for various fish species, such as our native largemouth bass. Come for one day or all three! Building reef balls is a fun and exciting way to help restore our Chesapeake Bay. Click here to register! Trappe, MD: Help CBF take out the trash! Join us at Bill Burton Fishing Pier State Park to help make the Choptank River cleaner and safer. This is a family friendly event, but all children must be accompanied by an adult. Groups are welcome! Please wear clothes you don't mind getting dirty, and bring sunscreen and water. Click here to register! Annapolis, MD: Join us for an upcoming trip aboard the CBF skipjack Stanley Norman. While aboard, you'll be invited to help hoist the sails or simply enjoy the view! You will leave with a better understanding of oysters and their role in keeping the Bay clean as well as what CBF is doing to restore the oyster stocks to save the Bay. Click here to register! Annapolis, MD: Head out on the water for a morning of fishing, learning, and fun! Spend the morning aboard the Marguerite in search of whatever is biting! Our experienced crew will provide all the knowledge and equipment necessary�just bring your enthusiasm! Gear and licenses are provided. Click here to register! Dorchester County, MD: Join CBF for a paddle! We will put in our canoes on Beaverdam Creek, and from there explore the waters surrounding Taylors Island Wildlife Management Area and Blackwater National Wildlife Refuge. This area is a prime example of a healthy tidal Eastern Shore waterway, replete with large expanses of tidal marsh and pine forests. The wildlife is dominated by various species of bird life, including nesting bald eagles, ospreys, herons, and ducks. 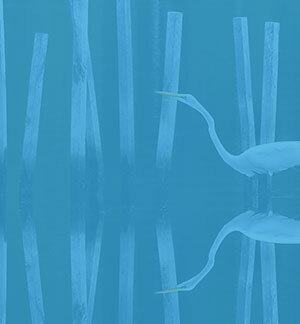 The paddle is comfortable and peaceful, offering up-close views of herons fishing in the shallows and ducks nesting in the many trees along the banks. This is a paddle for people of all skill levels. Click here to register!